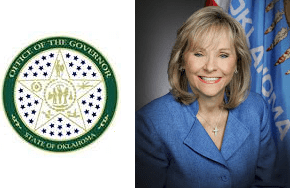 OKLAHOMA CITY – Governor Mary Fallin today issued an election proclamation that places on the November ballot a state question approved by legislators that would allow school districts to use property tax revenue, now used primarily for building funds, for operational costs such as teacher pay. State Question 801 would give local school board the flexibility and options to use existing property tax funds for use in the classroom, such as teacher pay and textbooks, without raising taxes. Like all state questions, it requires a simple majority by voters to be approved. Lawmakers this year approved Senate Joint Resolution 70, which sends to a vote of the people an amendment to the state constitution that would allow ad valorem taxes collected for a school building fund to be used for expenses associated with the general operations of a school district. Currently, a school district can levy up to five mills for a building fund. The deadline for the governor to sign election proclamations for state questions to be placed on the Nov. 6 general election ballot is Aug. 27.